National Brick Pavers and Stone is family owned and operated with over 30 years in concrete, paver & brick work along with landscape contracting. Committed to quality, we are constantly working to improve processes and design concepts to achieve the most natural look possible. Highly skilled in working with color combinations and mixing of patterns, our qualified team can get any project done – big or small – in a timely and professional manner. Although we specialize in brick pavers, we also will use other materials based on your needs. With our assistance, you are sure to put a unique and personal stamp on the landscape/hardscape accents of your home or business. We are experts in making your patio, walkway, driveway, outdoor living space, or entrance an asset to your home. Each National Brick Paver installation is custom tailored to the look and feel of your property. As a proven resale incentive, your investment in a brick paver hardscape will pay dividends when the time comes to sell your home. Available in a wide range of colors, shapes and patterns, your installation will be unique to your home, accenting the natural lines and shapes of your property. Our pride and joy is the design and installation of new driveways in Chicagoland area. We carefully assess and partner closely with the home or business owner to bring an overhauled driveway (brick, paver, or other) to life. This greatly improves the look and function of your drive. See more photos and examples of paver driveways to gain inspiration for your upcoming hardscape project. Fireplaces, outdoor kitchens and general living areas can add significant usable space to your home. Thinking of creating a new outdoor living space? Call or email National Brick Paver & Stone to get a free quote. In the meantime, browse through our recent outdoor living designs for ideas and inspiration. We are passionate about making your space unique and functional. As our homes or business age, managing brick / paver repairs and upkeep are necessary to maintain safety and value. National Brick Paver & Stone is happy to assess your current environment and recommend & implement brickwork and paver repairs. We have a wide assortment of colors, stones, pavers, bricks, sizes and shapes to choose from. Nothing gives off a great first impression of your home like a new entryway and front steps. Beyond improved safety, an overhauled front entryway and steps helps increase the visual aesthetic of your residence. Take a look at more information and photos of recent entryway projects to get a sense of what you would like to do to increase your home value today. Summer time is approaching faster than you might think. Installing a new patio is a great way to make the most of the warm weather to have friends, family, and coworkers over for outdoor events. Check out our variety of example patio designs we have installed in the Chicagoland area that we can create for you. Your family will be impressed! 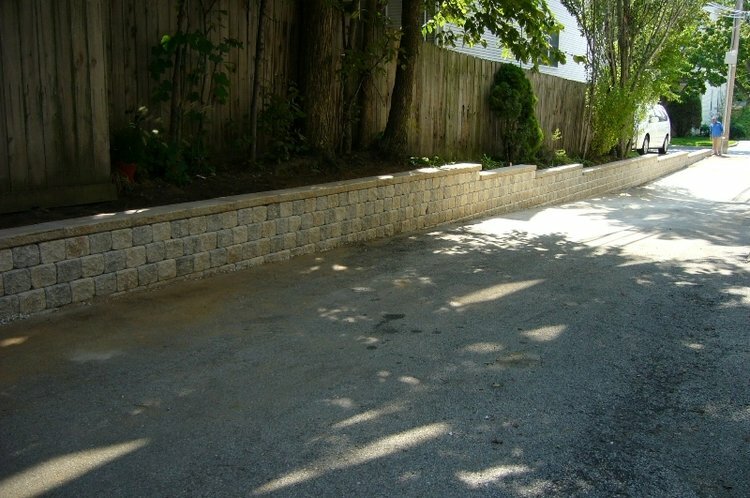 Keep the yard, trees, or neighbors at bay with new retaining wall installations for your home or business. Retaining walls can be highly functional for a variety of reasons, while adding clean lines and simplicity to your yard and landscape designs. New brick and pavers are a simple way to bring walls to life, that stand the test of time. Add new outdoor lighting to your walkways, driveways, and entry steps to increase the safety and look of your home environment. Simple lighting creates dramatic effects and helps your home/business stand out from the rest. Look through our photos of recent lighting projects to get some ideas of what you might like to have created for your residence. Call / email for estimate. Sidewalks, pathways, and walkways can improve the accessibility and safety of your home or business. New walkways designs will dramatically improve the look and function along the side or backyard, greatly reducing tripping hazards and mis-steps. View our recent walkway installation designs to get a sense of what we can create for you. National Brick Paver & Stone Company Inc. is committed to installing interlocking paver stone hardscapes that are not only beautiful, but guaranteed to last. We pride ourselves on using the most reliable, most durable, and best looking brick pavers in the market for your paver projects.